21P/Giacobini–Zinner is a periodic comet, which was discovered by Michel Giacobini on December 20, 1900. It was recovered two passages later by Ernst Zinner on October 23, 1913. During its apparitions, Giacobini–Zinner reaches about the 8th magnitude, but in 1946 it underwent a series of outbursts that made it as bright as 5th magnitude. It is the parent body of the Draconids meteor shower (also known as Giacobinids).The comet nucleus is estimated to be 2.0 kilometers in diameter. 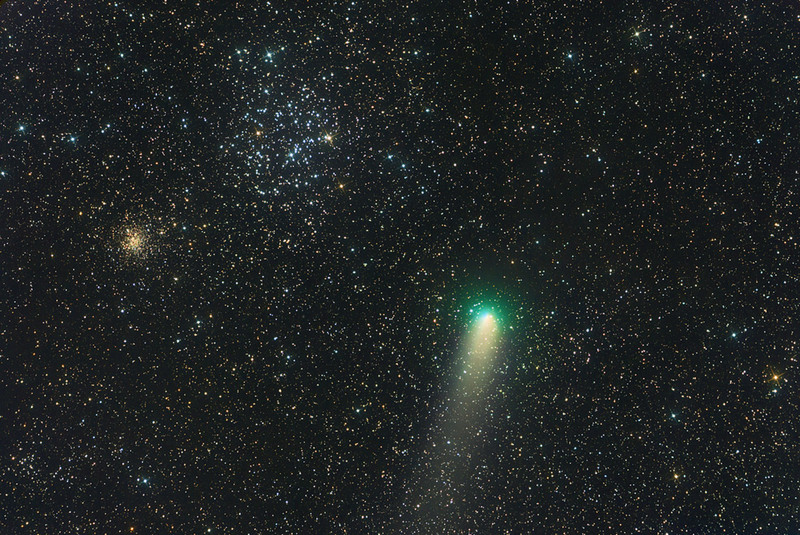 This images shows the comet on September 15th 2018 at 00:20 UT, near the open clusters Messier 35 and NGC 2158 (smaller, at the left).